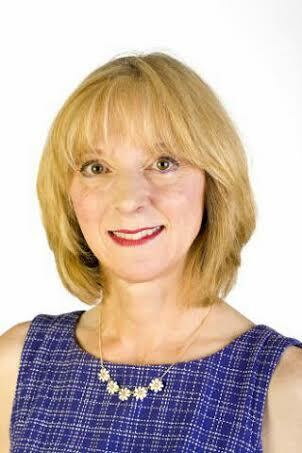 I am a neurological physiotherapist in the UK, with a special interest in Acquired Brain Injury and complex conditions, CVA, and Facial Palsy, and have been a provider of specialist Outpatient Facial Rehabilitation for the NHS for past 11 years. My teaching interests include training therapists to use Surface Electromyography (sEMG) equipment, as well as running workshops on use of sEMG for evaluation of nerve problems, and for Biofeedback. In addition I teach regular courses on use of Trophic Electrical Stimulation and present workshops to physiotherapists and Speech and Language Therapists on Rehabilitation for Facial Palsy. As the elderly population increases, this book fulfills a clear need for evidence-based and practical information on physical therapy for the older person. Studies have shown that on average at least 40% of the caseload of physiotherapy practices are patients age 66 years or older, in which case, as stated in the book, “every physiotherapist should be well grounded in the science of geriatrics & gerontology in order to be effective in making evidence-based clinical decisions related to older adults”. This is a comprehensive and well-laid out 600 page volume, full of information about the changes which occur with age, and thoroughly referenced throughout the text. It provides not only a detailed summary of the huge evidence-base for geriatric physiotherapy, but also supplies guidance to help the clinician choose appropriate tests and measures, then to interpret the findings in the light of the age-related and condition specific characteristics of a patient. So it is certainly a scholarly text, and will be a very useful addition to the library of any physiotherapist involved in teaching. But it is also a practical manual, with a multitude of very workable suggestions for treatment choices, frequently illustrated with black-and-white photographs. The section on exercise and physical activity for older adults is particularly useful, with a good number of specific suggestions for interventions, including a superb table containing a sample exercise programme which could be used with patients in a hospital or rehabilitation unit. The chapter on Balance and Falls manages to be both detailed and concise (an extremely useful combination), particularly in the assessment section, and includes some specific frameworks for best practice steps towards reducing falls; in addition, I expect I will be using the summary of functional balance measures as my first port-of-call next time I want to consider the alternative tests as it provides such a coherent overview. The general layout of the book is clear and well-organised, with diagrams, tables and boxes used to summarise information and highlight key points. New to this third edition: the references are not printed in the book, but instead there is a dedicated website which includes all references linked to MEDLINE. This is fantastic for easy access, and a boon for any clinician, but in particular any therapist who is involved in teaching will find this resource incredibly useful. There is a very minor weakness: the chapter concerned with skin problems in the elderly – or “Impaired Integumentary Integrity” as the chapter is headed! – has a large amount of pertinent and clearly set-out information, but the associated photographs are of relatively little use as they are black-and-white. A plea to the publishers: for the next edition of this book, please include colour photographs for chapter 19. This is a superb book, full of practical guidelines for the hands-on clinician, as well as having an enormous wealth of information on the age-related changes our bodies undergo, and the implications for physiotherapy assessment and management. 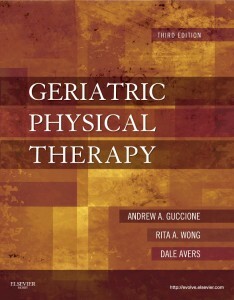 Geriatric Physical Therapy offers a comprehensive presentation of geriatric physical therapy science and practice. Thoroughly revised and updated, editors Andrew Guccione, Rita Wong, and Dale Avers and their contributors provide current information on aging-related changes in function, the impact of these changes on patient examination and evaluation, and intervention approaches that maximize optimal aging. Chapters emphasize evidence-based content that clinicians can use throughout the patient management process. Six new chapters include: Exercise Prescription, Older Adults and Their Families, Impaired Joint Mobility, Impaired Motor Control, Home-based Service Delivery, and Hospice and End of Life. Clinically accurate and relevant while at the same time exploring theory and rationale for evidence-based practice, it’s perfect for students and practicing clinicians. It’s also an excellent study aid for the Geriatric Physical Therapy Specialization exam.